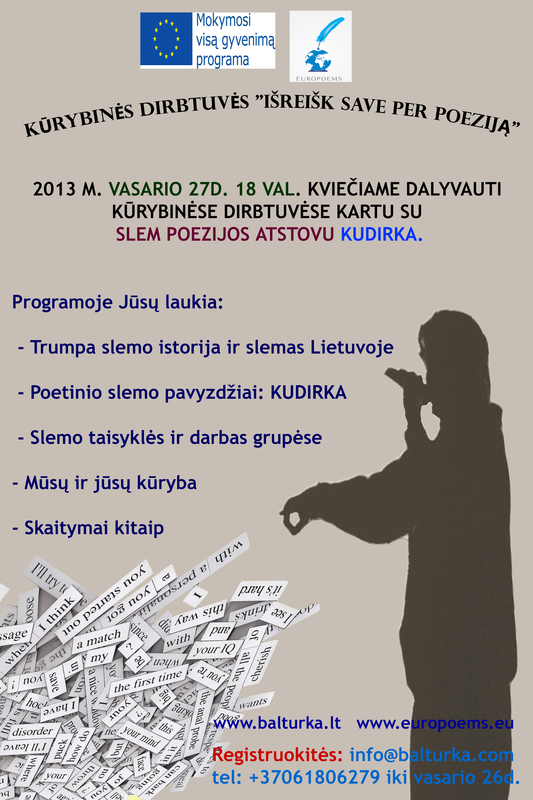 Event “Poetic Salad” is organized under LLP GRU “International poetic alphabet” project (www.europoems.eu). Aim of the event – to learn more about traditional cuisines through poetry. Each group (person/representative of country) brings traditional dish. There will be tables where you can expose your meal, decorate it with your countries’ flags or other traditional things. Representative (delegated member of the group) will present his/her traditional cuisine by reading poetry in native language with English translation on the screen. Also you can choose another way during presentation of your cuisine/meals you can insert poetry about traditional cuisine and dishes ( poems should be in native language with translation in English). Translation into English doesn’t have to be professional, just that audience could understand what were your poems about. Poems can be about certain meal, beverage, in general about cusine or its culture in your country. Each presentation shoul be around 10 min. If you are not able or do not have possibility to present traditional cusine/meal, be our guest, join and learn more about other cuisines. Poems with translation should be sent to project.balturka@gmail.com untill 27 of May 14:00.
ph. +37052151833 till 27 of May 14:00.